Last weekend I bought some fresh berries, with the intent of having berries for breakfast and being all healthy. 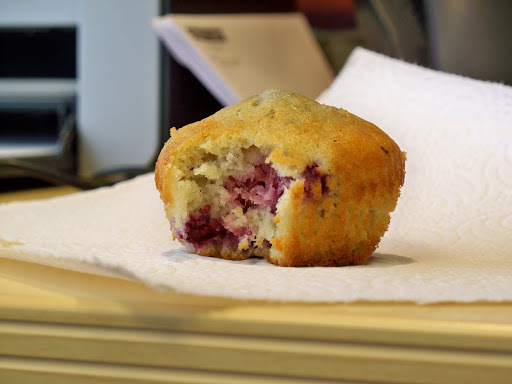 But then I decided it would be much more fun to make muffins. I used a mixture of blackberries and raspberries. They were very tasty! Some of them turned sort of blue at the top, but they still tasted fine. It wasn’t their fault that they looked like smurfberry muffins or something. At any rate, I had delicious breakfast for the week, if not the most healthy ever. 1 1/3 cups fresh berries , such as blueberries, raspberries, blackberries, huckleberries or sliced strawberries, or a combination. This entry was posted in Uncategorized on May 30, 2010 by michelejames. 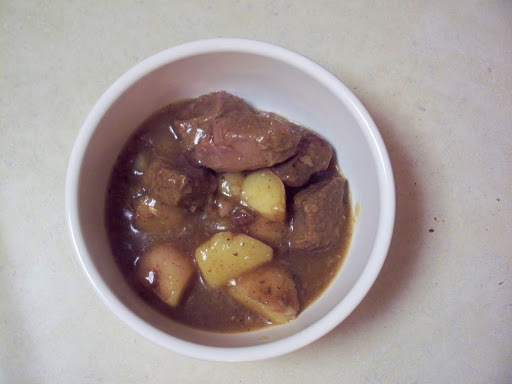 This beef stew recipe is one of my favorites ever. I make it a lot, especially when it’s chilly or gray outside. You can tell I like it a lot, because the page it’s on in my copy of The Lady and Sons Savannah Country Cookbook is really stained. The recipe includes carrots and celery. However, I like my stew to be basically meat and potatoes, so I tend to omit those. I also cook the stew a bit longer than necessary so that everything is falling apart. It tastes wonderful and comforting, just like stew should. And, like most stews, it is even better reheated. Brown meat in hot oil. Add water, Worcestershire sauce, garlic, bay leaves, onion, salt, sugar, pepper, paprika, and allspice. Cover and simmer 1 1/2 hours. Remove bay leaves and garlic clove. Add carrots, potatoes, and celery. Cover and cook 30 to 40 minutes longer. To thicken gravy, remove 2 cups hot liquid. Using a separate bowl, combine 1/4 cup water and cornstarch until smooth. Mix with hot liquid and return mixture to pot. Stir and cook until bubbly. This entry was posted in Uncategorized on May 29, 2010 by michelejames. Iron Chef Blogger Challenge: Spinach! This week’s secret ingredient was spinach. There was also a rule that it could not be a salad. I was a bit sad about that, because I wanted to try making a warm bacon dressing like the one I had at Mt. Vernon. However, I discovered another equally delicious way to combine bacon and spinach. I made a quiche! 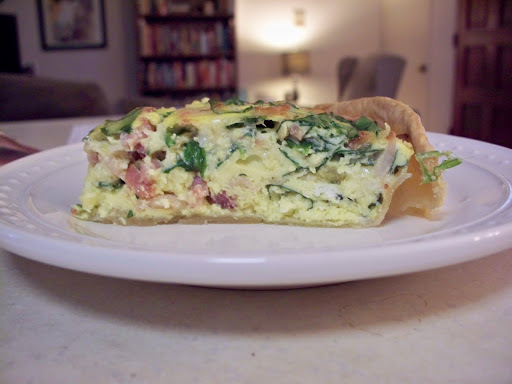 I had never made a quiche before, but it really wasn’t too hard. And, I think it came out beautifully. It probably helped that I was starving by the time it was done, but it was filling and very tasty. I would definitely recommend it. I accidentally dropped the lid to my nutmeg in the egg mixture, but it still seems to have turned out okay. Also, if you don’t have white pepper, black pepper is fine. I think it’s a visual difference more than a taste difference. The only other issue is that the original recipe calls for pre-baking the pie shell. I didn’t, but it might help keep the crust from getting mushy. I thought it was just fine without (and I didn’t have to deal with foil on the crust or anything). Preheat oven to 325. Cook onion and bacon in a large skillet until onion is tender and bacon is crisp. Drain on paper towels. In a medium mixing bowl, beat eggs slightly with a fork. Stir in sour cream, half and half, salt, pepper, and nutmeg (if desired). Stir in onion mixture, spinach, and both cheeses. Pour egg mixture into pastry shell. Bake in 325 degree oven 45 minutes or until a knife inserted near center comes out clean. If necessary, cover edge of foil to prevent over-browning. Let stand 10 minutes before serving. This entry was posted in Uncategorized on May 16, 2010 by michelejames. Iron Chef Blogger Challenge: Anchovies! The ingredient this week was anchovies! I was more excited than you might originally think. 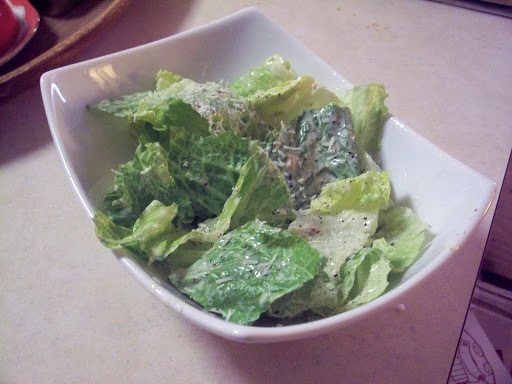 A few years ago I experimented with anchovies, in this recipe where you make a thin dressing and grill romaine lettuce a bit. It was really good. I immediately thought I wanted to make my own Caesar salad dressing. 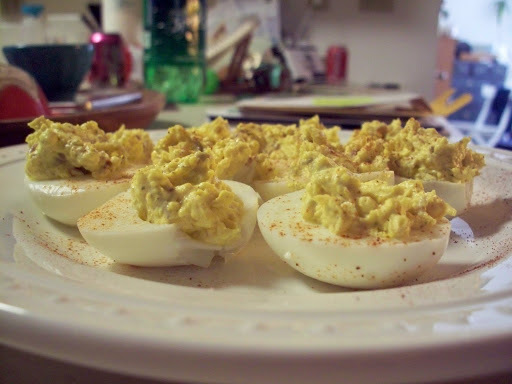 While I was looking up that recipe, I found one for anchovy deviled eggs as well. They were both really good. Anchovies, especially when minced, really aren’t that strong and add a nice salty sort of meaty flavor. I would definitely recommend both recipes! The Caesar salad recipe can be found here. I went with the option to substitute 1/4 cup mayonnaise for the coddled egg. I reduced the olive oil to somewhere between 4 and 5 tablespoons (at 4 I thought it was still a bit thick). The anchovy deviled eggs recipe is here. I didn’t use the caper garnish, and I didn’t use the fresh parsley either. My parsley plant has gone rogue again, so I just used a little bit of dried. This entry was posted in Uncategorized on May 9, 2010 by michelejames. A couple of months ago, LA Weekly came out with a 99 Things to Eat in LA before you die list, compiled by Jonathan Gold (who is a Pulitzer prize winning food author – he wrote the book Counter Intelligence: Where to Eat in the Real Los Angeles). We also sort of similar food tastes. For example, he doesn’t refuse to eat at Tito’s Tacos, insisting that it isn’t authentic (like so many LA “foodies”, but I digress). I am not planning to eat everything on the list, but I did take the interesting sounding ones off and make my own list. I’m a compulsive list-maker, it’s what I do. God bless the ‘Notes’ section of my iPhone. Anyway. 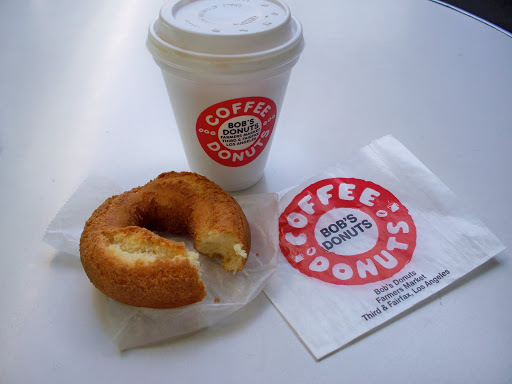 One item was the plain donut from Bob’s Coffee and Donuts. I have eaten here before, it’s at the LA farmer’s market. This place really is fantastic. It is simple and to the point. There is coffee, I guess probably a few other beverages, donuts, and some coffee cake. The coffee does not come in varieties (besides decaf), and the menu is not cluttered up with non-pastries. The coffee cake I had previously was really great. The donut I had today was probably better. This stuff is also cheap as all get-out, I think the donut and coffee cost me maybe $1.50. Eat This, which is another book I’m rather fond of, raves about their apple fritters. Not really up my alley, but some day I plan to get one for Travis, who does love a good apple/pastry combo. We eat quite a bit of fish, and I’m always trying to cook it different ways. Today we had salmon. I mixed some melted butter with garlic powder and a little Old Bay seasoning. Then I sprinkled it with some smoked salt and baked it. It’s served on top of some mixed greens. I also made some corn and a yellow rice mix. 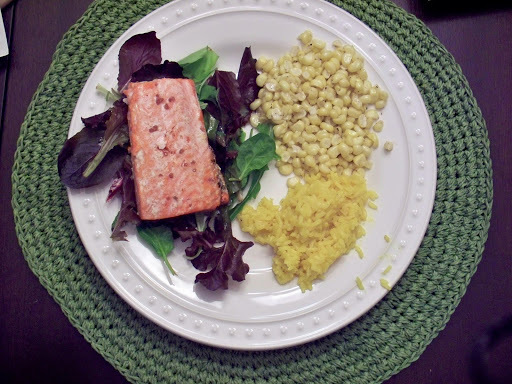 The creamed corn is just 2 corn cobs with the corn sliced off, a tablespoon of butter, and some freshly ground pepper. I put the butter on top and put the corn in the microwave for two minutes. Then I stirred it and put it in for another minute. It’s really quite good, probably my favorite way to eat fresh corn. The salmon was okay, but it definitely needed more seasoning. I also think I like salmon better broiled than baked, generally. But, it was a nice fast dinner, which was good after my garlic extravaganza of yesterday! This entry was posted in Uncategorized on May 3, 2010 by michelejames. Iron Chef Blogger Challenge: Garlic! This week it was my turn once again to pick the secret ingredient! I thought about it for a while, and for some reason I kept thinking about garlic. The Stinking Rose is one of my favorite restaurants, and the last time we were there, I bought their cookbook. So, I decided to recreate what I think is one of their best – Forty Clove Garlic Chicken. First, garlic had to be roasted! I used two cups of peeled garlic cloves. Travis had to help peel the cloves, my hand started cramping. (I ended up using 6 heads of garlic overall, between chicken and the salad dressing that I made. 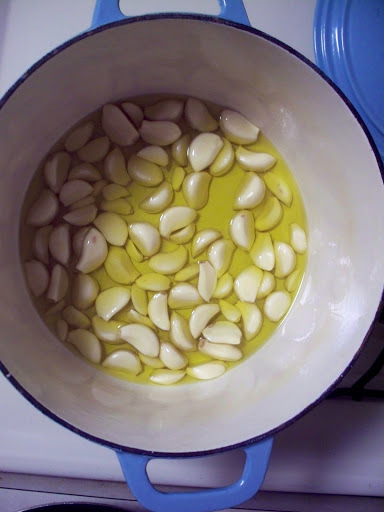 For the roasted garlic, mix 2 cups garlic cloves with 1 cup olive oil, cook for 40 minutes over low heat on the stove. Stir after 20 minutes. Then, use a slotted spoon to put the cloves on a cookie sheet and roast on 250 for another 25-30 minutes. This picture is really just because I was so dang proud that I quartered a whole chicken by myself. Never managed that before. The chicken was pretty dang tasty, if I do say so myself. The only thing I should’ve done differently was crisp the skin somehow. I probably should have cranked up the heat at the end or something. Or put it under the broiler for a minute? I don’t know. So, here’s the recipe! 1. Remove giblets from chicken. 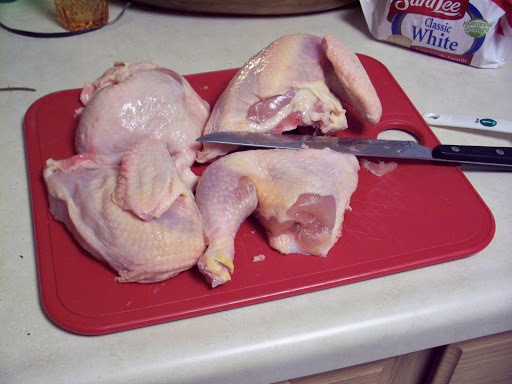 With a large, sharp knife, cut chicken in half lengthwise, then cut in half crosswise to separate the breast from the thighs. 2. To make the marinade: Combine all ingredients in a small bowl. Put chicken in a heavy resealable plastic bag, pour the marinade over the chicken, and seal the bag. Work your hands over the bag until the liquid covers all the chicken parts. Place bag in refrigerator for 1 to 3 hours. 3. To make the sauce: In a heavy saucepan combine the wine, shallot, rosemary, garlic, and thyme. Bring to a boil over high heat, then decrease heat to medium-low and cook, stirring occasionally, for 2-3 minutes. Gradually stir in the cream and cook to reduce the liquid by one-third, about 10 minutes. Add butter in batches, stirring to melt. (Note: Just try not to think about the amount of butter you just added. It’ll come to no good.) Season with salt and pepper. Pass the sauce through a fine-meshed sieve, cover, and set aside. 4. Preheat the oven to 350. Put chicken in a heavy baking dish and bake for 20 minutes. Remove from oven, turn chicken, baste with pan juices. Return to oven, bake 20 more minutes, or until skin is crackly and golden brown and meat is opaque throughout (Note: this never happened for me.. although I’m not sure why). 5. Arrange chicken on serving platter. 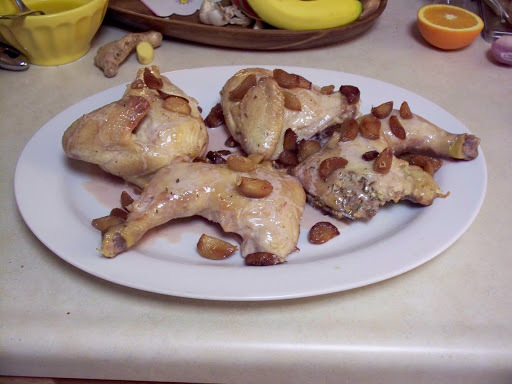 Pour warm sauce over the chicken and sprinkle with roasted garlic cloves. Serve immediately. What? You still want more recipes from other Iron Chef Bloggers? Fine! This entry was posted in Uncategorized on May 2, 2010 by michelejames.